A number of political figures have called for a boycott of the presidential elections due to the absence of a democratic process hours before the end of the presidential candidacy nomination period on 29 January. Leader of the Reform and Development Party Mohamed Anwar al-Sadat, Judge and Former Head of Egypt’s Highest Control Authority Hisham Geneina, Abdel Moneim Abol Foutoh, who ran in a 2012 presidential race, former Army Chief of Staff Sami Anan and Hazim Hosni are among the signatories who issued the statement condemning Egypt’s presidential elections. The statement denounced the legitimacy of the elections, set for March 26-28, citing various repressive practices taken against hopeful candidates. The signatories further called on Egyptians not to recognize the results of the elections. 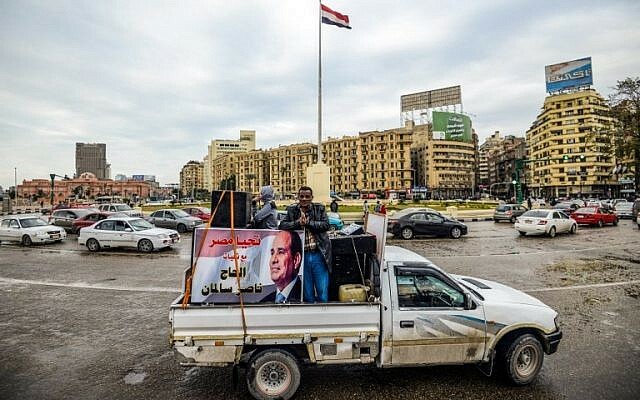 They also expressed concerns over how power is handed over between presidents, the general political environment in Egypt, in addition to the potential risk of constitutional changes eliminating presidential terms. Besides a last-minute submission by politician Mostafa Mousa Mostafa of his paperwork to the National Elections Authority on Monday, all of Egypt’s presidential candidates have either withdrawn due to the lack of a democratic process or faced legal circumstances that hinder them from running in the presidential race. Presidential hopefuls had to submit the required documents to the Authority before 2 p.m. on January 29 in order to be eligible for participation in the elections. Rights lawyer Khaled Ali withdrew his bid for presidency on Wednesday citing the lack of a democratic process that has been evident in the act of mobilizing people in administrative offices to support al-Sisi in exchange for money, among many others. On Tuesday, Anan was arrested by Egyptian authorities. The campaign of Anan suspended its activities until further notice, according to the campaign’s official Facebook page. Al-Sadat also announced that he will not run for the upcoming elections due to the absence of a clear guarantee for the integrity and impartiality of the competition. Former Prime Minister Ahmed Shafiq announced early January that he no longer intends to run in Egypt’s upcoming presidential elections and MP Mortada Mansour also announced his retreat from the presidential race. Earlier in November, Colonel Ahmed Konswa was sentenced to six years in prison after announcing that he is running for Egypt’s presidential elections. Konswa was charged with violating rules of the military and expressing political opinions.